The sheer mention of ‘Rajasthan’ transports us to a world of royal weddings, stunning locations and magnificence. Every couple planning their wedding day wants it to be perfect and unforgettable. Right from planning the wedding destination to opting for a palace, resort or banquet hall, a lot goes into selecting the perfect venue for your wedding day. We are here to ease your dilemma and help you make your wedding a memorable affair. 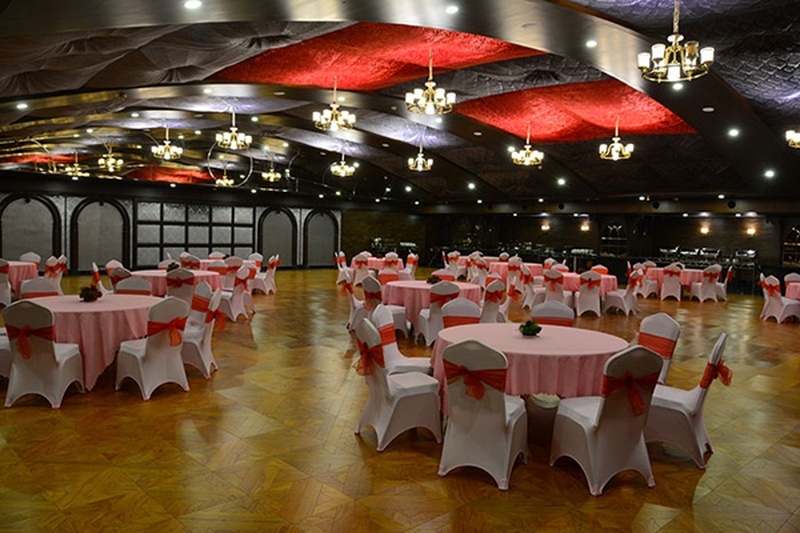 Here’s a list of the most popular banquet halls in Rajasthan that offer a world-class service. Radisson Blu in Jaipur has been in the hospitality sector for a long time and is the best venue to host your grand wedding celebration. The multiple banquet halls have spectacular interiors and architecture. They are best to host various wedding functions and have a maximum floating capacity of 450 guests. Crowne Plaza offers a comfortable stay with modern accommodation facilities. With beautifully-designed interiors, the venue comprises of 3 party areas and a lawn. The lawn clubbed with one of the party areas has a maximum floating capacity of 1700 guests. The venue is ideal for small pre-wedding functions and main wedding ceremony, catering to all your wedding needs. Holiday Inn, Bais Godam, is one of the prominent wedding destinations in Jaipur city and offers a comfortable atmosphere to any function held here. With a floating capacity of 550 guests, the Chancellor Banquet hall at this venue is suitable for medium-sized pre-wedding functions, cocktail and reception parties. The magnificent Le Meridien also has multipurpose banquet halls that are ideal for hosting various wedding ceremonies. For every small or big wedding function, the multiple banquet halls are a one-stop solution. With a maximum floating capacity of 600 guests, this venue is ideal for pre- wedding functions like sangeet, mehndi and reception parties. The multipurpose banquet halls, Crystal 1 and Crystal 2, are designed to suit all your wedding day needs. The venue offers modern amenities that prioritise the requirements of guests. Both the banquet halls can be combined for bigger functions. With a maximum floating capacity of 450, the venue is ideal for various pre and post-wedding ceremonies. Looking for a good and spacious banquet hall near C-Scheme in Jaipur? Pebble and Rosewood at Shakun Hotels & Resorts is a great choice for hosting various wedding functions and ceremonies. Rosewood banquet hall is one of the finest pillarless ballrooms that have a 6500 sq.ft area and a wooden European theme, and Pebble banquet hall is again a pillarless option steeped in luxury and elegance. With a combined floating capacity of 1100 guests, the banquet halls are perfect for hosting bigger wedding functions. Clarks Amer is situated in the heart of Jaipur and has extended its services to a lot of wedding functions held in the Pink City. Situated in one of the prominent and busiest areas of JLN Marg in Jaipur, this hotel has multiple party areas with a maximum floating capacity of around 4500 guests, making it suitable for grand wedding ceremonies. Four Points by Sheraton in Jaipur boasts of a compact banquet hall, which is suitable to host small, intimate pre-wedding functions like engagement, sangeet, mehndi and reception parties. With a maximum floating capacity of 250 guests, the venue offers impeccable hospitality coupled with modern amenities. Country Inn and Suits offers two mid-sized banquet halls that are perfect for hosting small, private pre-wedding functions and cocktail and reception parties. With a maximum floating capacity of 120-180 guests, it offers world-class amenities and services that make a wedding day a special affair!